KATHMANDU, Dec 5: At a time different candidates have been promising to build roads, among other things, to attract voters, progress in road construction, however, has remained very poor. The government has managed to spend only Rs 7.88 billion, or only about 10 percent, of the total Rs 75.59 billion allocated for different road projects in the first four months of Fiscal Year 2017/18. 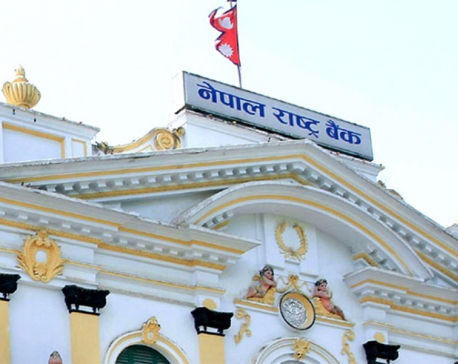 Road projects like Baglung-Beni, Damak-Chiasapani, Debsthal-Kaindanda-Chaurjahari-Dolpa, Phikkal-Shree Antu Danda, Outer Ring Road of Kathmandu valley and Thori-Bhandara-Lothar-Malekhu road projects made zero progress in the four months of the current fiscal year, according to a report for the period prepared by the DoR. Billions of rupees have been allocated for this project. But they have failed to spend even a penny. Likewise, Sitapaila-Dharke road project, which has received a budgetary allocation of Rs 200 million, has not been able to make any progress. Other road projects that have not made any progress are Kumud Bodh Marga (Banke), Nepalgunj Ring Road, Lumbini-Bhairahawa Ringroad, Tribeni, Dumkibas-Gaindakot-Ramdi-Ridi-Tamghas-Sandhikharka-Gorusinghe-Taulihawa road. Likewise, Mahakali Corridor (Brahmadev-Jhulaghat-Darchula-Tinkar) has achieved only 0.15 percent progress in the first four months of the current fiscal year. Few projects, however, have achieved good progress. Benighat-Arughat-Larkebhannjyang and Beshishahar-Chame-Manang road projects have achieved 60 and 32.5 percent financial progress, respectively, while north-south corridor projects in Karnali, Koshi, Kali Gandaki basins has achieved an average of 35 percent progress. The DoR has now been relieved of the burden of administering small roads this year. This means its engineers cannot focus on big or strategic projects. The government has entrusted small road projects to newly elected local bodies.